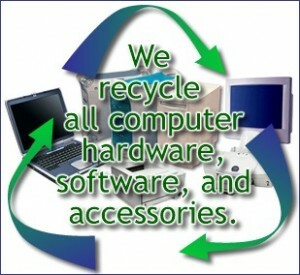 Los Angeles Electronic Waste Recycing, Laptops, Cell phones. Do you have an old computer lying around taking up valuable space in your home? Is there an outdated printer that you’ve been meaning to get rid of, but simply haven’t had the time do so? Are you uncertain as to where you can drop of your old electronics to be recycled? Computer City Repairs now recycles electronics and even offers free pick up of your unused computers, laptops and printers. Instead of wasting time searching the internet to find out where you can recycle electronics in you area, only to have drive to the location to drop it off, you can simply call or email Computer City Repairs to come and pick it up for you free of charge. We make it easy for you to do you part to help the environment while making more room your home. Computer City Repairs also offers used computers and laptops for sale, if you’re interested in upgrading to a newer model with more features. In addition, we are the premier destination for all of your computer repair needs. From virus removal to laptop screen replacement, our highly skilled technicians have the experience it takes to accomplish virtually any IT repair service.